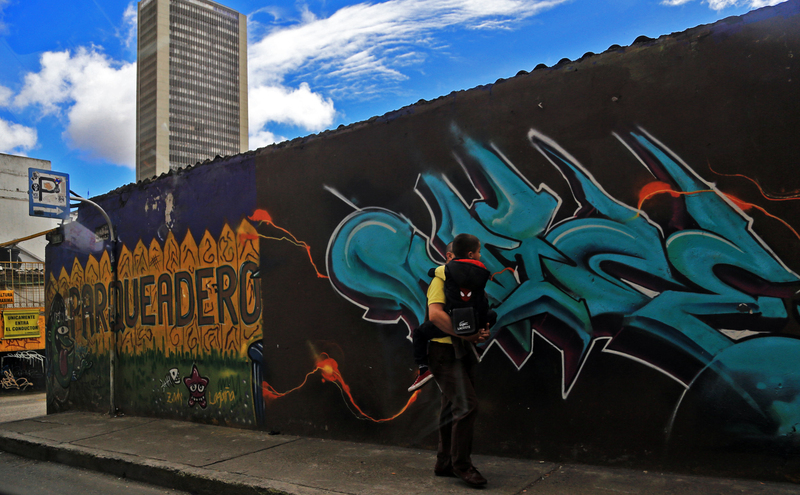 Today’s destination is Bogota, Colombia. A country and a city with a somewhat shady reputation; With some of the highest murder rates in the world and where lawlessness is an everyday phenomena: tourists in large numbers have been robbed, assaulted, kidnapped or worse. 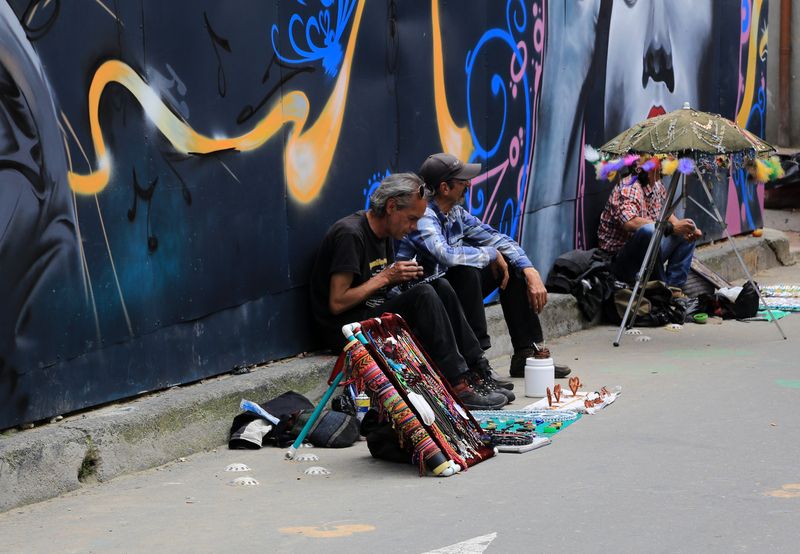 In recent years, luckily crime rate has been halved and according to travel media, Bogota is one of the hottest travel destinations in the world. Bogota, or Bogota Distrito Capital, Bogota DC , is the capital of Colombia and area- and population-wise the largest city in the country. The city covers 1,587 sqm (613 sq m) and the population is 10,700,000 in the metropolitan area, 8,080,734 in the city (2017). 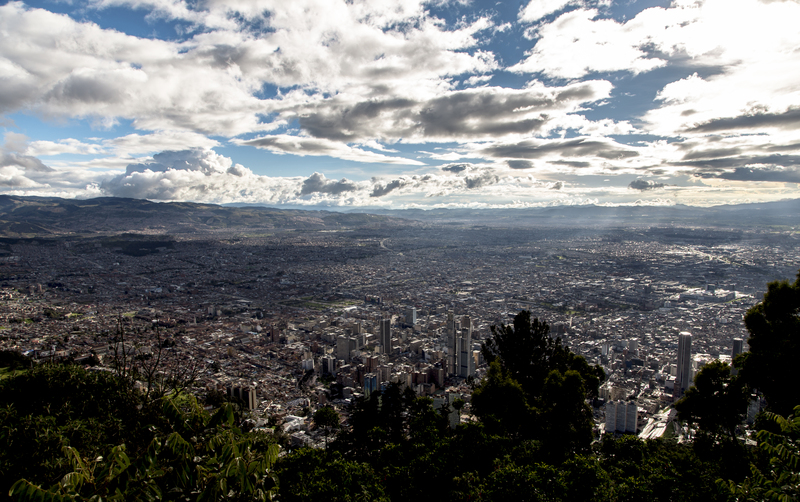 The city is 2,640 m asl (8,660 ft asl). The city was founded in 1538. A for once very thorough advance destination research revealed that a Bogota visit can go both ways; be super or scary. Due diligence and a low profile is recommended. 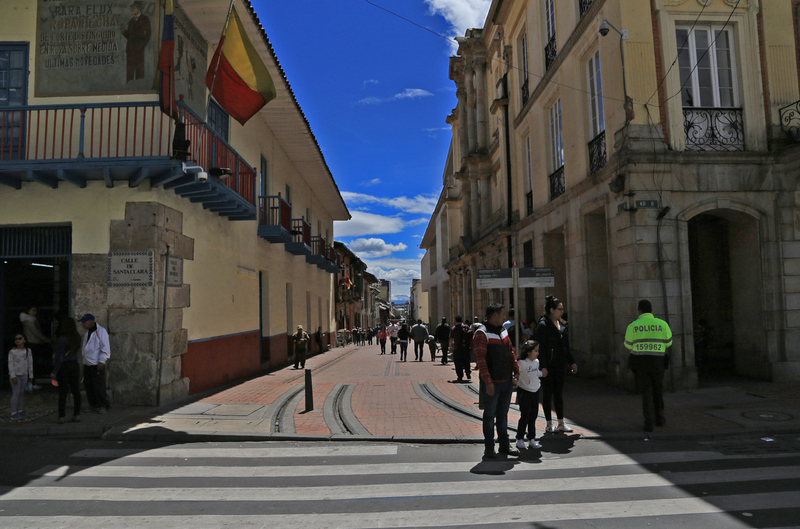 According to several Bogota travel renditions; if you flash jewelry or expensive cameras, you are apparently asking for trouble. So we, hubby and I, do not. A slightly shabby and jewellery free appearance is today’s fashion look. However, the cameras cannot be avoided, so I look over my shoulders over and over. 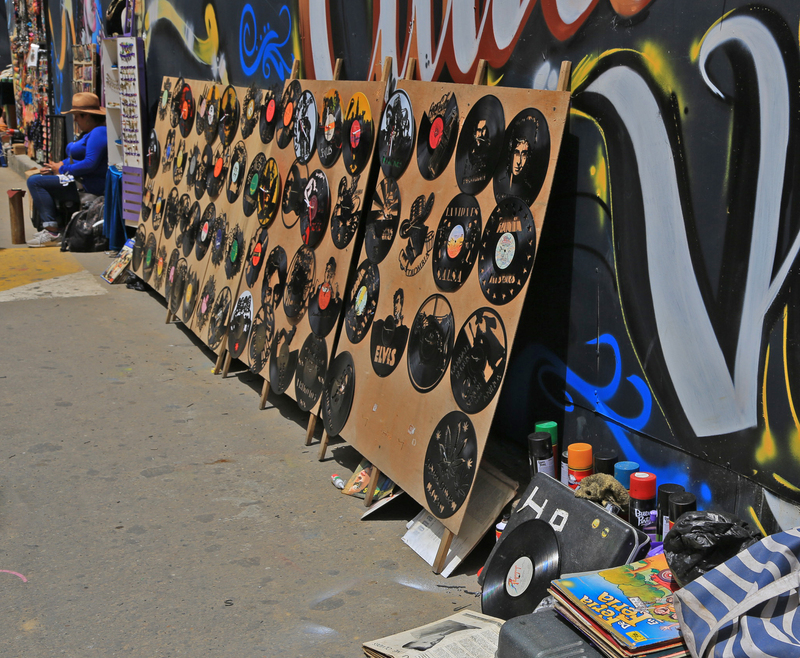 Today’s Question: How much can you see on a single day in Bogota? 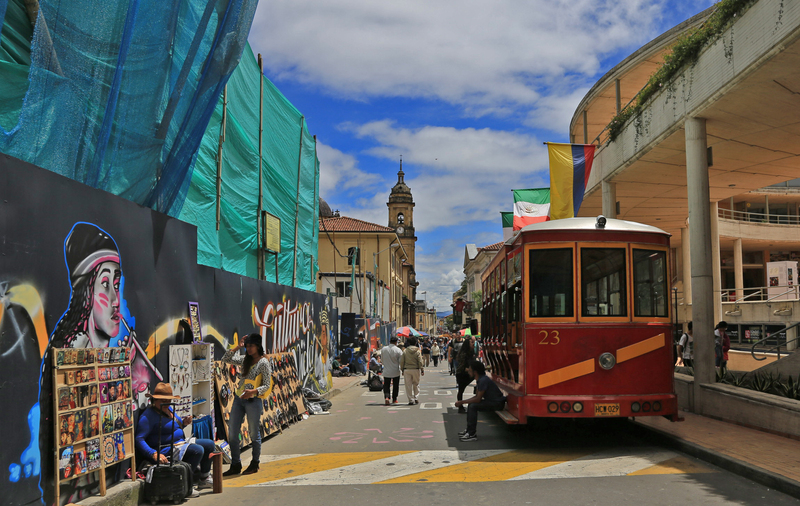 Unfortunately, Bogota does not have red HopOnHopOff buses running throughout the day throughout the week in European cities. Here in this city there are green buses running only Wednesday-Saturday. Too bad when you are visiting Sunday-Tuesday! Instead we take a taxi from the hotel. You can either book through the hotel, it costs approx. 10% extra, or contact a driver yourself. 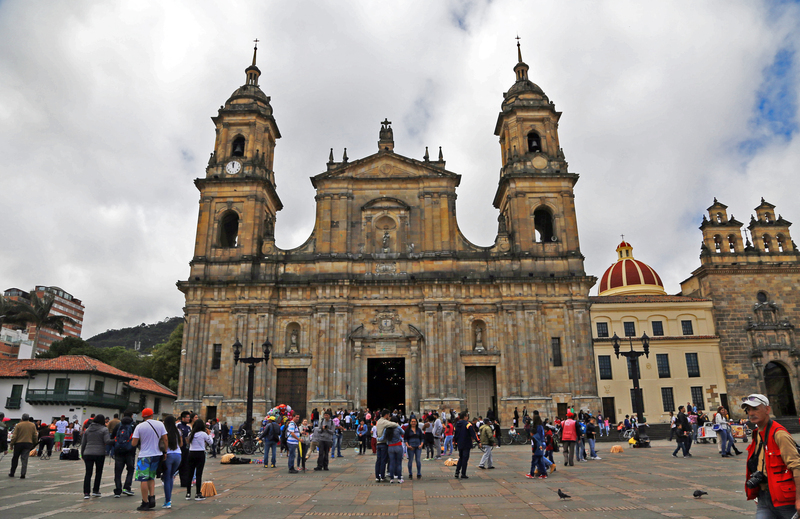 A fixed price is typically around 180,000 Colombian pesos for a four-hour tour. Ours was a good deal, for this trip including museum visits and mountain visits lasts in 7 hours! La Candelaria, Centro Historico de Bogota . The historic district. We walk around in some small streets with colorful houses and activities on sidewalks and streets. 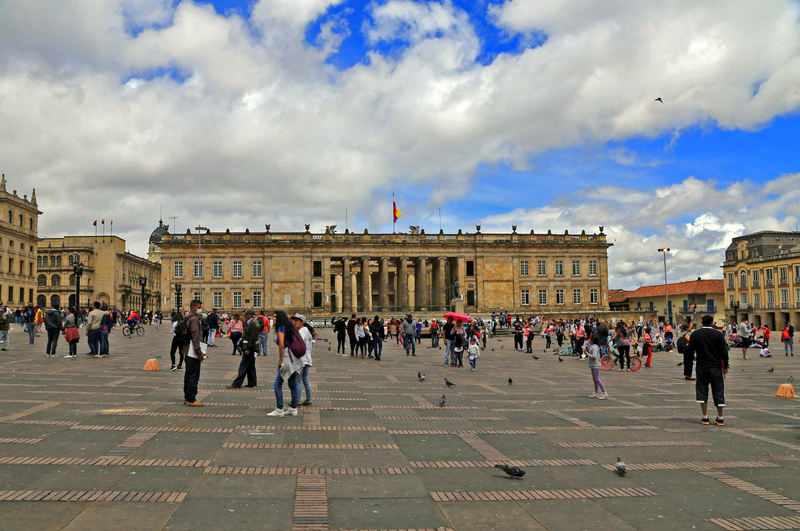 We visit Plaza de Bolivar , the very large central square, where we see Capitolio National, Catedral Primada and Palacio Justicia and several other beautiful buildings. In a corner of the square you find the Tourist Information, which does not make ‘a lot of noise’ from the outside. 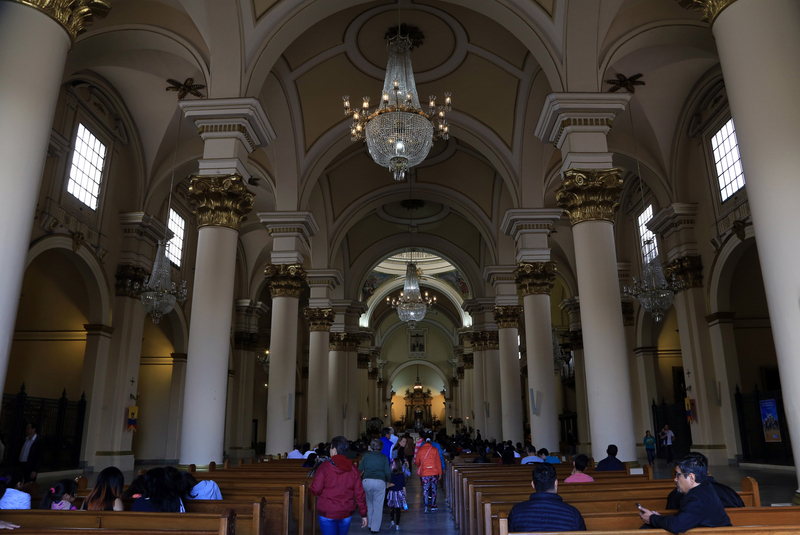 However, inside you get a very friendly and informative service and a free map of Bogota and Candelaria. 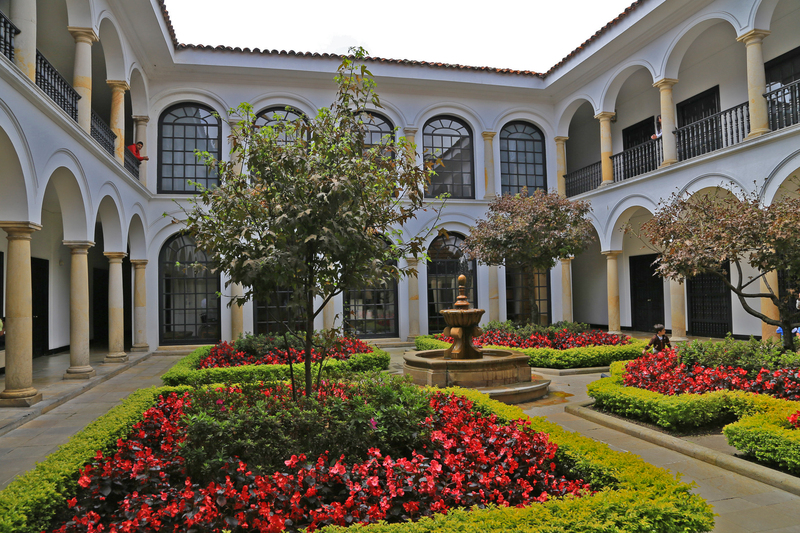 We are told that on Sundays all museums in Bogota are free to visit. A super offer, which many locals and tourists make use of. 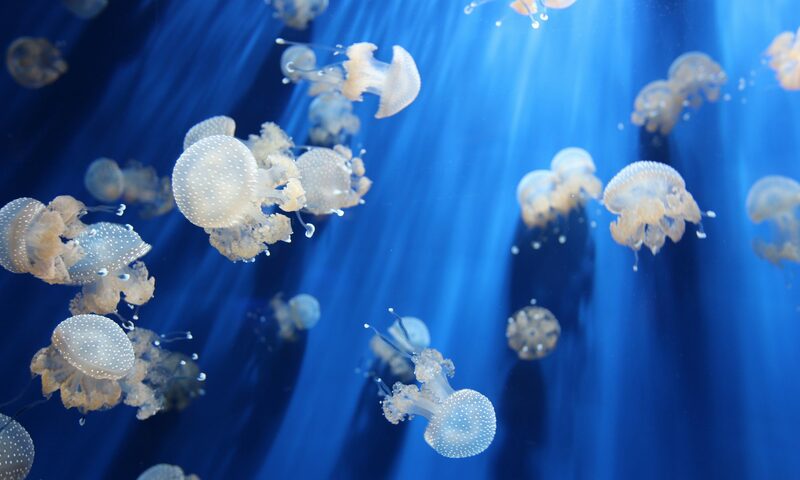 So if you want peace and quiet – and to take photographs – you might want to to choose another day. But not Monday, where almost everything is closed! 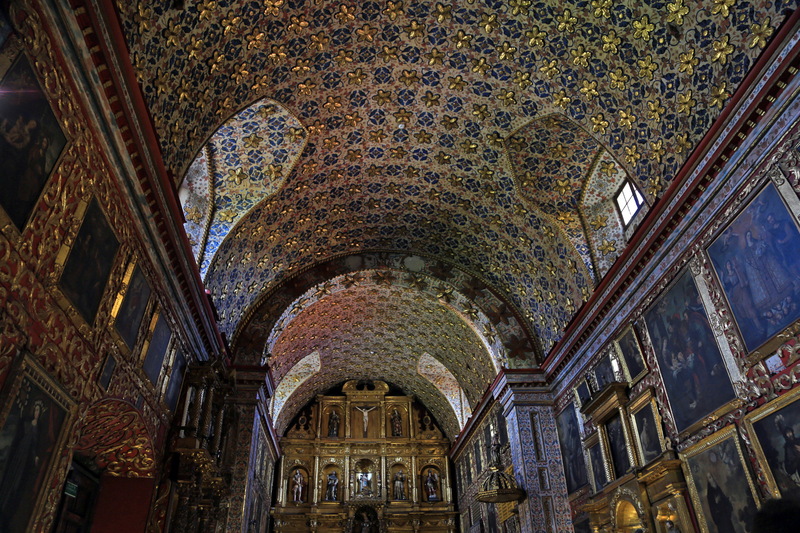 Down the street from the plaze is another highlight: Iglesia Santa Clara (museum). 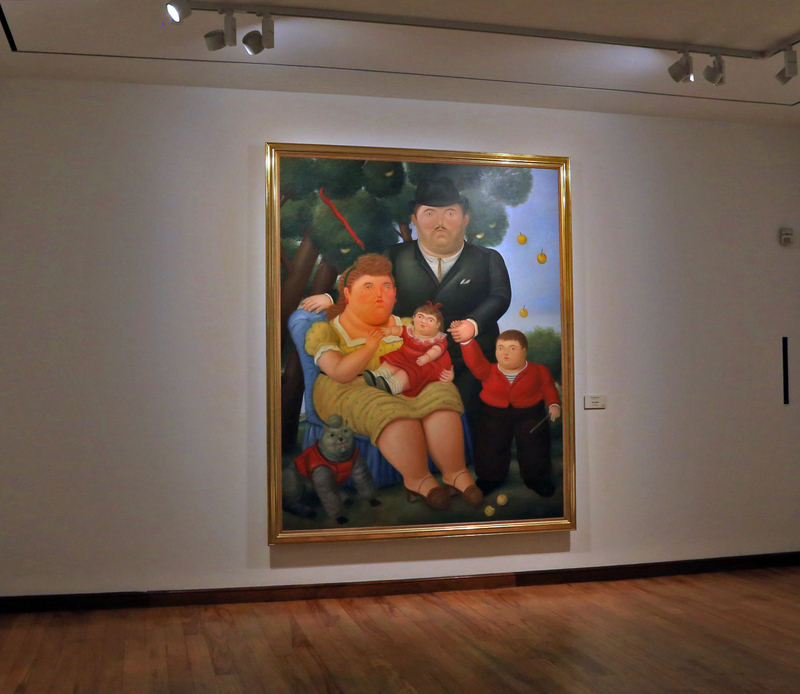 Today’s second museum visit goes to the Botero Museum. 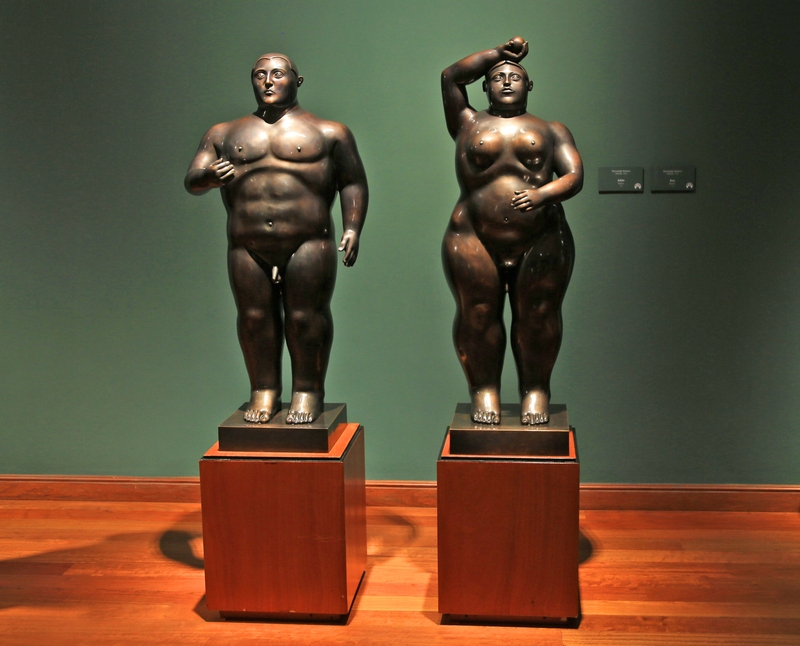 Botero, who, a European may think, but when you see the portraits of chubby people ; – ), you recognize the unique style of Colombian artist Fernando Botero Angolo; Boterismo). 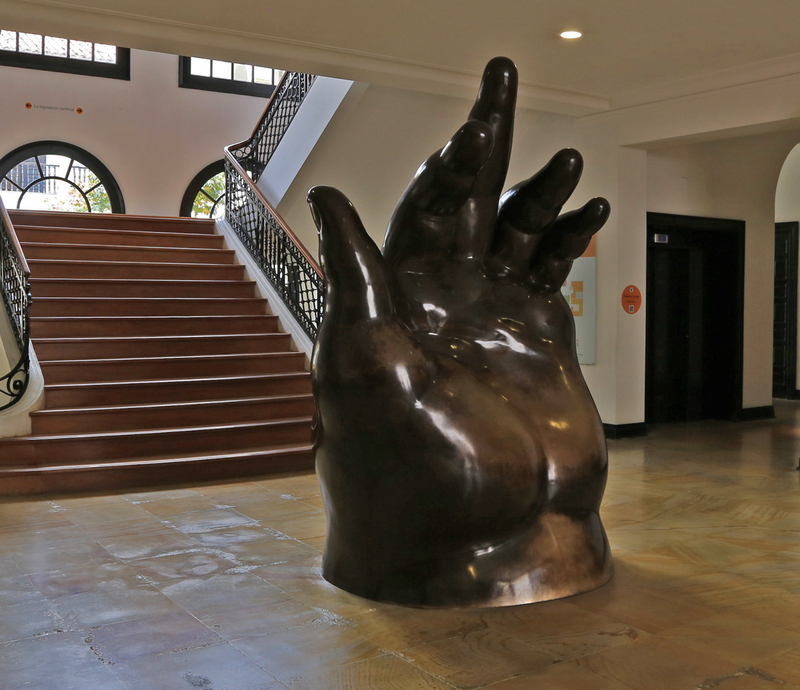 The museum also houses works by Picasso, Dali, Chagall, Monet, Henry Moore and more. 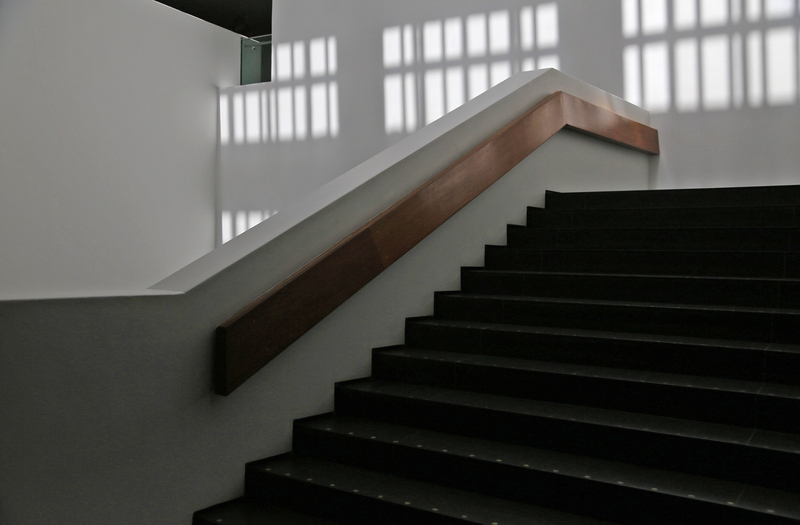 Definitely worth a visit – also because the decor is dark and atmospheric. 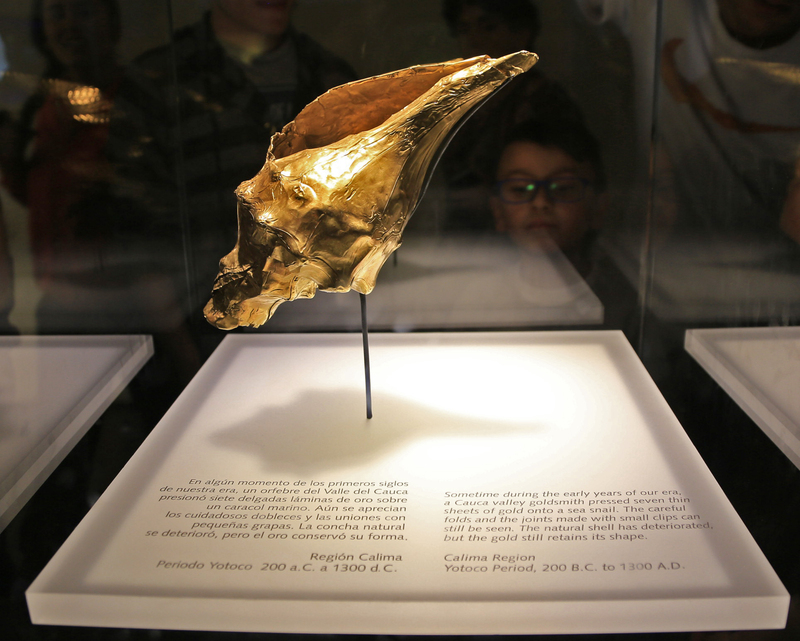 Today’s third and last museum visits go to the Gold Museum, Museo del Oro; An exciting and enlightening experience; With a wealth of information about precious metals and their processing. 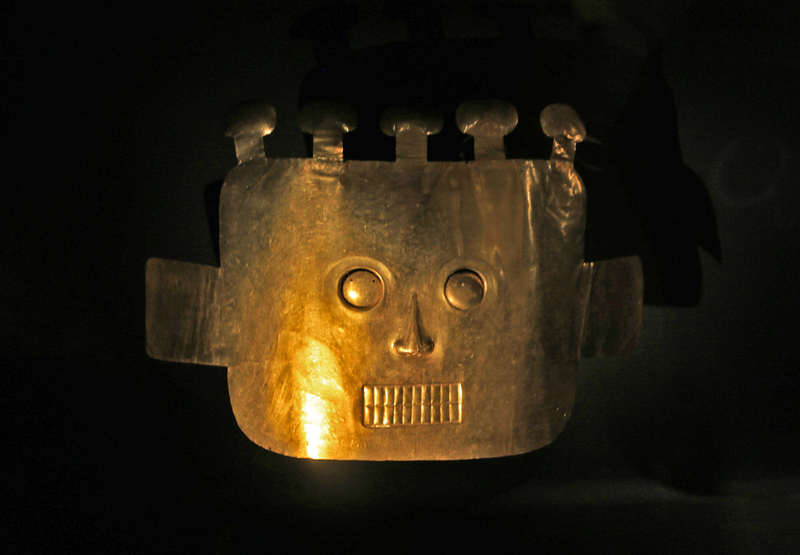 And unique, invaluable gold treasures from many areas around Colombia. 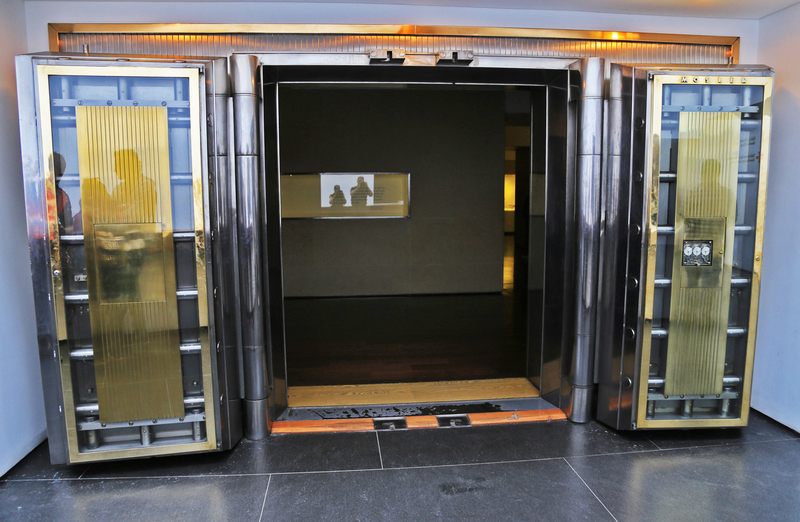 An enormous vault door into one of the museum’s exhibition rooms with priceless gold objects. The two photographers are reflected in the glass, an unwanted selfie. 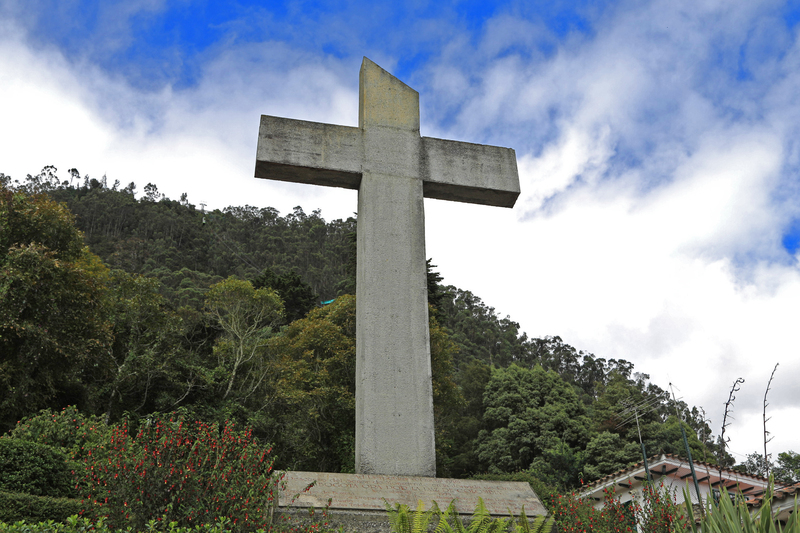 The day ends with a visit to the Monserrate mountain and the church at the top. You can get there by a mountain railway or gondola. Throughout the day there are long queues and traffic jams and nothing has changed, when we go back in the afternoon. Recommendation. Do this in daylight. Many want to take photos of the sunset from the top. However, it means that you first get down around dusk, when criminals are lurking. Quite a few report that they have been stopped and robbed in this setting. We wait for 45 minutes in line to go up with the mountain tram. When we reach the top we visit the church and go for a small walk. It’s a nice sunny weather, which is a bit unusual in June, which is normally cloudy. 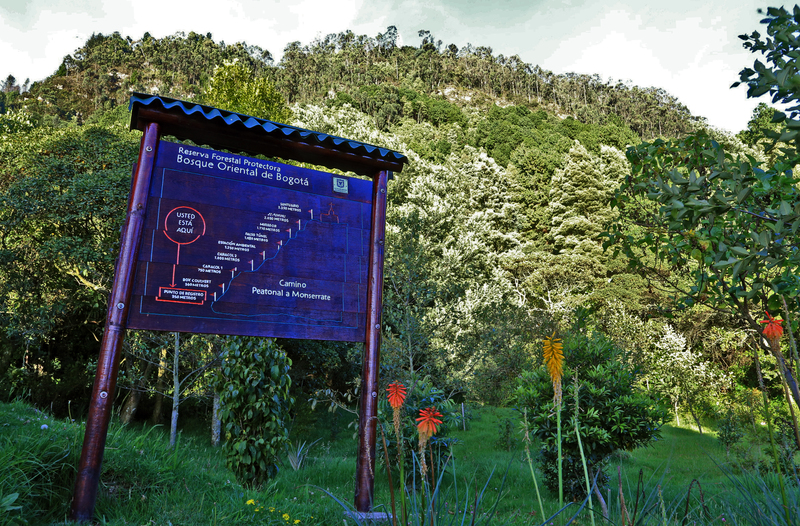 Do not visit Bogota for the weather: The yearly average temperature is 12-15 degrees – it’s in the mountains – and it’s cloudy most of the time with frequent rain falls. That said, the climate feels nice and I like the mild, varied weather, while we are there. 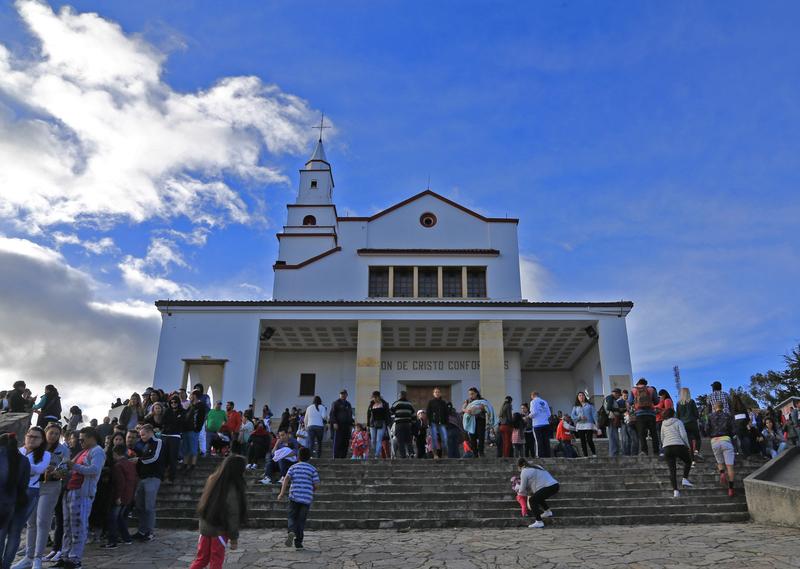 Later when we have to go back down from Monserrate – I have bought a return ticket – we can see that there is an hour-long queue to go down … what now? A sign tells us that there is a camino, trail, down the mountain, but it is closed from 4 o’clock (a little while ago) and this route is at your own risk. 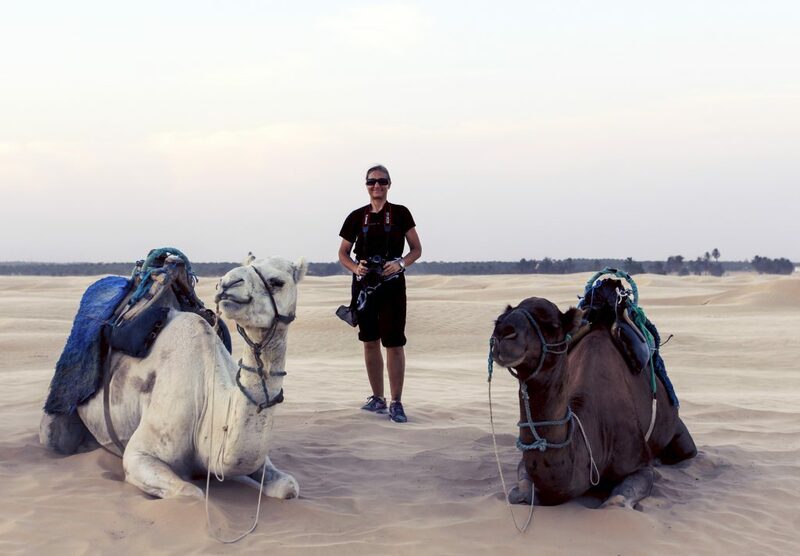 However, we see some locals go that the way, so we follow in their footsteps. A long, steep trail and occasional stairs down, down, down. 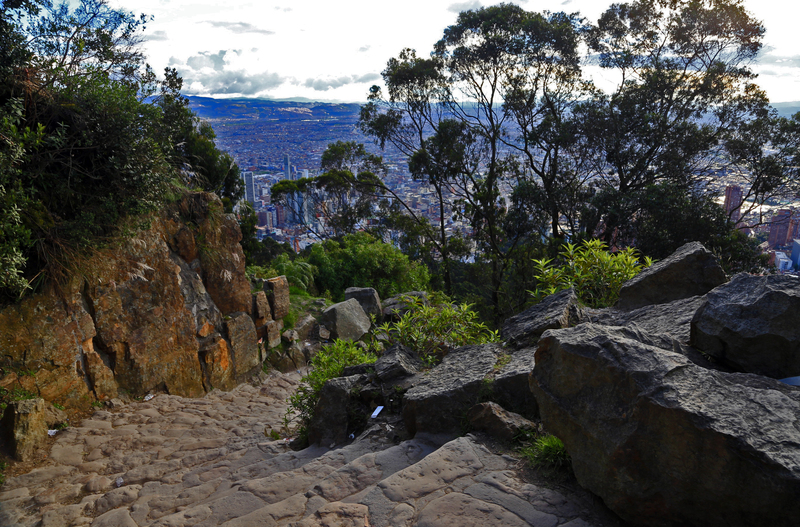 This tour is not for people with knee problems, but otherwise it is an experience with amazing views of Bogota. About 1 hour later, at a slow to moderate pace with photo stops, we are all the way down by the ticket office again. This was today’s trip. 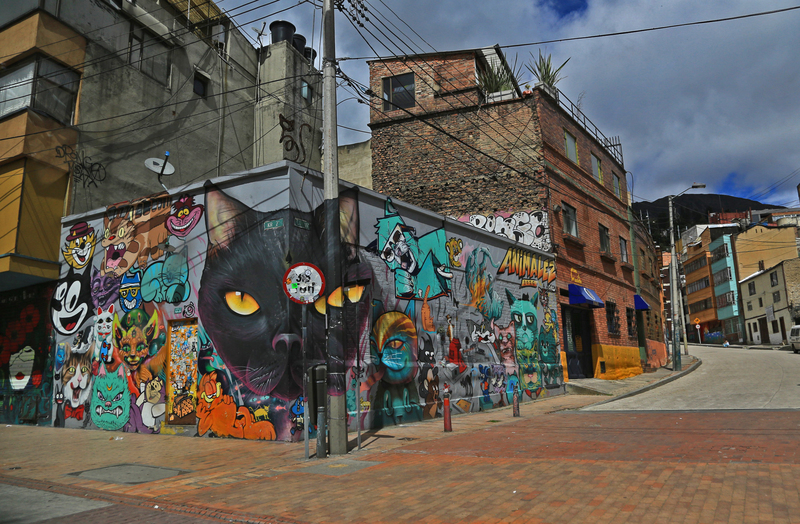 The return taxi trip offers more Bogota sightseeing with grey and gloomy concrete and brick quarters, but with impressive graffiti everywhere. Graffiti? On beautiful buildings? No thanks. In bleak areas where it does not deface, but brighten? Yes please; Brilliant street art. In Bogota, though, it is extremely widespread and covers entire buildings, walls, doors, windows and more (frustration feeds art?). At 18 o’clock we are back at the hotel. Then we dine and afterwards swim in the pool and relax in the sauna.